Kyle asked me what I thought about Denver Snuffer’s latest book “Passing the Heavenly Gift”. This is my reply. Denver Snuffer is a friend of mind, and I love him. I haven’t chosen to read his latest book yet, so I don’t have an opinion to offer you on it. But, we have spent a few hours discussing the subject of criticism of the Brethren and the Church, whether the criticism is true or not. Simply stated, he and I do not agree on this subject. I do not criticize the Church simply because it isn’t my calling. I don’t fault the Brethren because it doesn’t change anything. I wouldn’t publish something outlining whatever flaws I might detect merely because I most assuredly do not see the candle as extinguished. Whatever flaws exist are irrelevant in my opinion. They are irrelevant because I personally have enjoyed a full measure of blessings the gospel promises, without being limited by whatever flaws exist – and frankly, it seems, so has Denver. It doesn’t require a microscope to detect the mortal condition. It doesn’t even require 20/20 vision. But, when my heart burns, and the Sprit flares, and the heavens open – all in fulfillment of ordinances, convenants and priesthood from this Church, I say, can it actually be broken, and yet still bind the heavens to fulfill its ordinances? Especially as the end comes, and the cleansings begin, and Zion takes its first breaths, all of these flaws will be burned away. This is the very reason the latter-day tribulations begin in the Lord’s house — to set everything right, lift the condemnation spoken of in scripture, and prepare it for its greatest voyage. The Lord has His hand upon the tiller of the Church, and it is His place to correct it. Nothing I or Denver says will steady the ark. In my opinion such things can only sow discontent and challenge testimonies and darken faith. He apparently sees his mission differently, which is just marvelous. Some must push, and some must pull. Honestly, if the Lord came to me and told me to take a different tack — I surely would. But, He has not, so I bow my head and wait, and I support and love and honor those who man the oars, sails and bilges of the latter-day work. But, my calling is to stand on the bow and shout encouragement, not to fret about the depth of the water beneath the keel. I also candidly give to Denver the benefit of any doubt that he may truly be called to say things that I am not. When I speak with him I feel the Spirit, I feel his goodness and his faith, and believe that he has seen what he claims. But for me and my house, we will stand in our Holy Places, and wait. Denver has a very special place in my heart because he was instrumental in my full reconversion to the church after a decade of unbelief. I was all but officially disconnected from the church. I had spent years struggling to understand every religious, philosophical, or scientific idea I could that promised answers to life’s toughest questions. I lost belief in Mormonism, Christianity and even God (after being raised in the church, serving a mission, and marrying in the temple). After constructing what seemed like a solid framework for reinterpreting spiritual experience and God, I concluded that phase defeated and heart-broken. It was at this time that I was exposed to Denver’s writings which presented an invitation to once again trust in the terrifying possibility of God. His testimony was at first offensive to me but I had to respect what I perceived to be an open-minded lover of truth. I had never received such powerful, discernible and undeniable witnesses than what occurred as I read his words clarifying and expounding on doctrine. It lead me to pray again vocally to God who I had long abandoned with the most honest seed of faith I have ever produced. My exposure to Denver helped guide me to what has been personally confirmed to me to be the baptism of fire. My life has changed because of the invitation that was extended to me through him. Everything has changed and instantly I find myself reborn a passionate believer in the Gospel and restoration. I do believe that he has been prepared to reach a specific type of person (My type apparently 😉 I have read his first two books and his blog but have not yet read passing the heavenly gift which I have heard is a little controversial. It is a tough line to walk but I do feel strongly that he has been called to do a specific kind of work. He does not invite all to read his book, that goes for active believers as well. I have felt the spirit in these blogs but I have also felt it from his words. I am so grateful to hear different people, and different personalities give humble witnesses to the truth. The content of this blog presumes you are already familiar with Denver Snuffer’s books. Careful explanations given in the books lay the foundation for what is contained here. If you read this blog without having first read his books, then you assume responsibility for your own misunderstanding and misinterpretation of the writer’s intent. Please do not presume to judge Mr. Snuffer’s intentions if you have not first read his books. Thank you for your perspective. I’ve heard both perspectives, but like I said, I am not the judge, and Denver is being very brave in delivering the message he feels he must. The establishment didn’t get along well with Lehi either. John: I have read every one of Denver’s books and in my heart his words have not sown discontent, challenged my testimony or darkened my faith even though at times I have felt assaulted. I do not doubt it will in some. Christ’s message also grew differently in different soils. Denver’s message has lifted the scales from my eyes. His style is at times biting, and sarcastic but always Intrepid. It is certainly not my style or your style but as I have taught the same message to my family and others using my style instead of his, the message has been well received. The Lord tells us in scripture that we are “asleep”, “blind”, and “deaf”. What I see in Denver’s actions is his trying to wake me up by throwing cold water in my face. Not an easy way to wake up but I would rather be awake. For some that will be true. Like I said, I’m not judging him. He may well be saying just what the Lord wants him to say. I don’t envy him his pathway though, because it isn’t going to be an easy one. You stated very well my experience and my perspective. Thank you! I have to say I haven’t read Br. Snuffer’s books. I read the synopsis of his latest on Amazon.com. I’ve read his last week’s blog entries. It may not be fair, and I’ll be the first to admit that (I already have), but there are a few things that make me uncomfortable with his writings. I suppose one should take it in light of his entry from 1/19 on false spirits, where he says, “True spirits will…Lead you to be submissive to authority in the church…False spirits will…Lead to rebellion against the church’s right to administer ordinances…” But here goes: It appears to me he calls into question the continuation of authority from Joseph Smith, criticizes the right of the bretheren to lead, the level of inspiration the brethren receive, the identity of the Church as the Lord’s true and living Church, and more. To me, I think the pattern you gave us, Brother P., in the iron rod consisting of scripture, the words of the living prophet and apostles, and the words of Christ as revealed through the Light of Christ, is the way to follow. The alternative is apostasy. I tend to agree, but still decline to judge him. Thanks for your comment. I appreciated your response to Kyle’s question. I agree that everyone has a different mission to perform. Our ministries are unique. Yet there is one common element to every true messenger. They will never want the spotlight on them, they only lead others to Christ. Each writer/prophet in the Book of Mormon had a different calling as well, yet each shared the same message of leading others to Christ. Their delivery and words were different yet the message was the same. For example Nephi and Jacob, differed from Samuel the Lamanite and Abinidi. Unfortunately, sometimes preaching repentance to a religious people can be misconstrued as being critical even though the true motive is out of love and concern. Whether one sees the Latter Day church as flame brightly burning or a red hot amber spark.. Each of us needs to come to the “candle” with the proper “flammable” material within ourselves for our individual “wicks “ to be ignited. 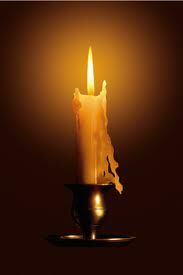 Our personal candle needs to have the flame lit by receiving the Heavenly Gift. Only by and through Jesus Christ is that made possible. I loved your video I just posted on the Blog. It was so inspired and filled my heart with faith. Thank you for producing it, and welcome to the Un-Blog. I haven’t read the book from Denver referenced, but I have read three of his books and I also frequently read his blog as I do this one. I plan on reading this book in the future, but I am reading so many other things that I cant fit it in. However, what I read feels true and returns my trust in Christ and Christ alone. I fear that I have been far too dependent upon the precepts of man, that I take little thought to consider my correspondence with Christ. I think that we consider zion as a group effort to come unto Christ. Zion is not anyones answer to their problems of coming to Christ. Each person must qualify as an individual regardless of where you live. Zion is only a breading ground to develop people who serve one another to show their love to God and to His children. I believe a misconception of zion exists in our current culture that reflects the worlds view of a Utopia. This idea seems skewed. I read both your blog and Denver’s blog. I have never felt the need to “reconcile” them or felt that all people who have received great blessings of the Lord must be clones of some sort. I enjoy soaking in the good from any source. Amen, and amen! In my office I have a standard for me and my employees, and it says: “You can celebrate the problem to the extent you have invested in a solution”. That was beautifully said. My wife & I have read the book and I believe Denver Snuffer has a mission to accomplish which may include his particular message. Whatever the case, the charity evident in your words is uplifting. Its a great example of how we all need to approach our personal journeys. Thank you for this comment it was very well said. You have a gift of saying things just right that I would love to develop Brother John. I am thankful for your example. Thank you Brother John for this blog. We are so grateful for your articles, and feel the Spirit burn within us when we read your words. We were listening to one of your tapes while traveling a week ago, and at a certain point in your talk, the Holy Ghost filled our car, we were both moved to tears, and I almost had to pull the car off the road in order to gain control. We are full-time missionaries and feel the Holy Spirit all of the time, but this was so powerful, it was almost too much to bear. This particular moment came in a direct answer to prayer, and was just the right thing, at the right time, to fill our souls with confidence and Hope. We look forward to attending these firesides in person when we return in a year from now. May the Lord continue to bless you. I follow both yours and Denver’s blogs closely, and have read all of both of your books. I feel the same way as you do–unless I was specifically called by the Lord to point out flaws, I would not feel comfortable doing so, and I am left to assume that must be part of Denver’s ministry. My husband has been one of those who is aware of the flaws and has lost his faith. For myself, trying to deal with everything that was drudged up as he lost his faith was traumatic. I had to stare those flaws in the face, which was hard for me and something I had tried to avoid in the past. Even though the tone of his blog didn’t always resonate with my personality type, Denver’s writings were instrumental in helping me logically cope with the problems in the church in a way that strengthened my faith and I think helped me become a little more open minded. I discovered both of your writings just as things were getting bad with my husband’s faith and I am so blessed that I did. Two testimonies of the tangible reality of the gospel really helped me get back on my feet when things were rough and confusing. Thank you Brother Pontius, that was a beautiful response. I am very glad to have read all of both you and Denver’s books. I do believe that both are trying to convey very similar messages to all of us. That we have the ability to have our own personal audience with the Second Comforter, if we completely submit ourselves to become Zion. We must remember the church is not perfect, but the gospel of Jesus Christ and His Priesthood is perfect, and we need both to have that opportunity to have that sacred audience someday.